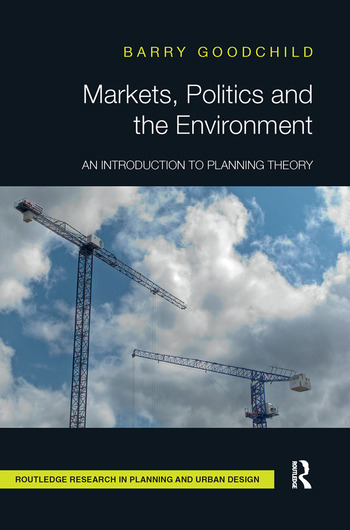 What is planning?’ and as part of this ‘What are its key features as a style of social practice and action?’ and ‘How does planning as a style of social practice relate to social and economic change? How, as part of the justification for planning, might claims of valid technical knowledge be constructed? What is meant by ‘rational’? What is the contribution of pragmatism as a supplement or replacement to rationalism? How might rationality and pragmatism be adapted to postmodernism and the requirements of diversity? Finally, how may concepts of planning be reoriented towards sustainable development as a collective duty? How might sustainable development be reworked in relation to planning as a means of managing and stimulating change? Each group of question is discussed in a separate chapter and is associated with different theories, debates and examples of practice. Markets, Politics and the Environment concludes that the full implications of sustainable development and climate change point in the direction of a different type of state- a green state whose future functioning can draw on planning theory but at present can only be conceived as a sketchy outline. Barry Goodchild is Professor of Housing and Urban Planning at Sheffield Hallam University, UK. Over a long career, he has secured the publication of five books and 39 articles in refereed journals, and has worked for research clients in England, Scotland and France, including the UK Economic and Social Research Council.